I think you know what I mean when I say, this spasmodic system of blogging I have going right now isn’t quite working out. Nothing for weeks, then a few posts, then nothing for months…. Yeah, bad idea. It’s too easy for me to just put it off or forget all about posting. So from now on, I’m going to do things differently. Every Monday, there will be an update. Every Monday! By creating a deadline for myself, I’ll hopefully start getting done all the things I created this blog to do. So, to my handful of followers, I now solemnly pledge to update at the front of every work week. Maybe if there’s lots to say I’ll do more than that, but for now just expect a once-a-week minimum. So now that that’s settled, this Monday’s topic is none other than the original robot in red and co-star of Mega Man 10, Protoman. This page appeared in the Capcom Friendly Club’s mail magazine from Autumn, 1996. Capcom’s official fan club booklet was one way Capcom of Japan interacted with their country’s fans. They would announce and create a buzz for upcoming game releases and merchandise, while also featuring rare official and fan-made artwork, puzzles, character background information, and sneak peeks behind the scenes of game development. Up until now, the secret origin of Blues has been shrouded in mystery. But here, for the first time, they will finally be divulged! Wishing to hide the fact that this was a remodeled robot of Dr. Right’s, Dr. Wily crafted these. Although comparable to the Rock Buster in ability, the tremendous energy consumption makes it unusable for long periods of combat. Also, without some transformation mechanism like the Rock Buster’s, it’s unable to change freely into the form of an arm. Due to his near human-like capacity for thought Blues leads a greatly conflicted existence, torn between his creator Dr. Right and the man who had saved his life, Dr. Wily. 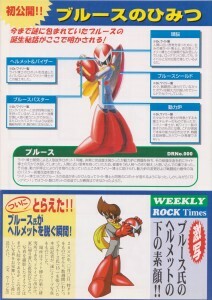 Regarding his relationship with Rockman, he plays a dual role as both an older brother and a rival type figure. Because his body was not originally designed for combat, he suffers from weak stamina which the shield helps to compensate for. Initially Dr. Right had utilized his specialty, a type of solar energy based system. It was exchanged by Dr. Wily with a purely Wily designed atomic power system. This causes him some trouble when it comes to performing at his peak ability, as he is only able to battle at full power for a short time. The very first humanoid robot prototype developed by Dr. Right. Although this achievement greatly exceeded his expectations on several levels, Dr. Right found there to be a critical problem with Blues’ power reactor. He made plans to modify and repair the robot, but Blues absconded before Dr. Right had a chance to. His human-like mind convinced itself that the remodeling could cause him to essentially become like a different person, so he fled to protect his sense of identity. Some time after that, his power reactor began to fail and he lay collapsed and dying. He was found and saved by Dr. Wily, who modified him by changing out his power reactor on top of equipping him with a buster and combat abilities. It was from this opportunity to remodel Blues that Dr. Wily gained the ability to manufacture robots at the same level as Dr. Right. Nevertheless, his attempt in “Rockman 1” to use Dr. Right’s remodeled robots ultimately ended in failure. Captured on film at last!! Mr. Blues removes his helmet! Dateline 20XX. After trailing one Mr. Blues (age 15) around for weeks, this reporter has finally landed an exclusive scoop photograph! The scene was Dr. Right’s laboratory. We had already set out out for a leisurely drive around the neighborhood, when we were suddenly greeted with this unexpected sight upon our return. The cameraman who took the photograph is still recuperating in the hospital, but we hope this delightful picture will bring him a speedy recovery. So, there you have it. Nearly 6 years after his debut in Rockman 3, Capcom finally added some clarity to the history of Blues, his hit-and-run style of fighting, his confusing relationship with the two doctors, and what Dr. Right was talking about in Blues’ ending to Rockman 2 the Power Fighters. The article at the bottom seems to be mostly a joke at the expense of Blues’ hair. While I certainly enjoy the mental image of Blues punching out a paparazzi, I figure the reporters had probably, in their scramble to get the shot, wound up in an automobile accident. Or perhaps, he was so overcome with shock that his brain simply shut down? One thing that surprised me was the mention that Blues’ arm doesn’t freely transform like Rockman’s does. 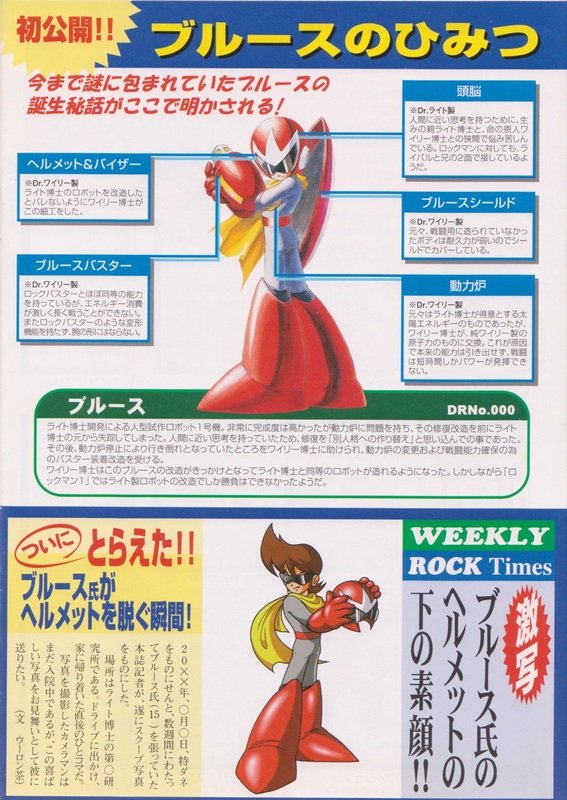 For one, because we’ve seen plenty of times (on that very page even) where Blues has had two fully functional hands, and he has been portrayed like Rockman himself in the games and in official art to be able to equip his buster on either arm. Perhaps he exchanges his arm parts similar to how Roll equips her Roll Buster in MvC, by some kind of plug-in or snap-on system? Between his scarf, belt and shield I suppose he has plenty of places to carry such parts. Although the idea itself still seems awkward to me. Maybe it just means he’s got an older and clunkier version than Rockman’s newer one. This page suggests that while Dr. Right’s initial power reactor flaw is no longer in effect, the atomic power system (because it was not originally designed for his use) still causes Blues a similarly dire predicament. And even though he’s already been remodeled and so should have dispelled the idea of losing his sense of self, he still refuses Dr. Right’s offer to work on him. I don’t want to speculate too much, but now that he’s become a fully playable protagonist in MM10, could it be that this power issue has been improved already? Perhaps in Mega Man & Bass, when Dr. Light repaired Proto after his early battle with King? So far there hasn’t really been a definitive word on Protoman’s power problems after Power Fighters. But it’s also not clear whether MM&B happens before or after MM2TPF, so maybe Dr. Light learned of Proto’s new situation after working on him in MM&B but didn’t devise a solution to the problem until a bit later? Well, either way, it seems Blues is just far too independent and self-reliant to want anyone messing with him again, if he can help it. And since that’s part of what makes him so awesome, I can hardly argue. 13 Comments to "Monday Blues"
All the translations you've been doing are great. Definitely a great asset to the community. I'm very much looking forward to seeing weekly updates. Keep up the good work! This particular article about Blues' secrets clears up quite a lot of mysteries that were first introduced to the English fanbase through Mega Man Powered Up. Especially the last tidbit about Wily's remodeling occurring before Rockman1 very nicely validates the "what-if" scenario from that game. I was a little disappointed that they didn't say where Proto Man was during the first two games, but you make a good point! Leaving it open ended makes it a lot easier to insert him in games like Powered Up without any conflicts. In powered up you could unlock him, so maybe Blues was helping Rock in the background. By Rock I mean Rockman. I would like to point out that it says he cannot change his buster to a hand, yet that same article shows him taking of his helmet with two hands. Funny. All in all though, I am gald that people do translate these for me, and other fans. You translation of the MegaMissions helped me out alot, and I have to credit Zan for showing me your blog. Thank you for your comments too, VileMKII! It's great to hear that people are enjoying my work. Thanks for spreading the word, you guys! In my fanfics, despite me knowing every character that I use’s personality, and even being praised for an extremly accurate depiction of Sans from Undertale, despite not playing the game, Blues could only be described as OOC (out of character) in my fanfics. His first appearance was a quick one, and, attitude-wise, he was in character, telling his siblings to leave him alone, and while he did make a joke or two, they were in the form of sarcasm. But it was mentioned that he liked videogames, namely Minecraft, and later, in his first main appearance in my fanfics, he was still pretty serious but once Lily, my OC, mentioned Minecraft, his attitude quickly changed, and instead of telling her to go away, he started talking, amd once Lily mentioned that she was Luna, a Minecraft YouTuber that he liked, he pretty much had a fanboy freakout, and the two quickly became best friends. He is also a memelord in my fanfics, and loves techno and alt-rock music, as well as actually having a crush on Lily, (but he’s too much of a tsundere to admit it), and is actually known for saying funny things, even mid-battle. He hates when anyone but a family member (Dr. Light and all of the other DLNs) or Lily, who is his best and closest friend, calls him by his real name, insisting that everyone else call him Proto. He also never takes off his sunglasses, although both some of his siblings and Lily have managed to steal them ( his eyes are green in my comics, since all the incarnations of Mega Man but the orginal have green eyes, so I thought, why not?) but unless he’s fighting someone or is in any other dangerous situation, he never wears his helmet. And when he uses his Uniton Stone transformation, (long story, it’s a fanfic thing) , due to him having the electric Uniton, his helmet is off most of the time, even though the Unitons are only used in combat, but this is mostly due to the static charge making his hair all messy and floaty. Also, despite having the same copying ability as his brother, he never uses it in my stories. So yeah, he’s pretty OOC in my fanfics, but I still like my portrayal of him. Ben: * interrupting Lily* Focus, Lily! Yeah, we all know what she was going to say. ) Anyhoo, there are a few funny non-sarcasm things he’s said, but they’re all meme refrences. Ooops, mistake. Flora is Flower Woman’s real name, Melody is someone else. Now even more of Lazasha/Blades Woman’s sisters have appeared, We’ve met Snow Woman/Crystal, and Jet Woman/Mimi (Callback to an old story of mine which had a pilot named Mimi), Flower Woman/Flora has appeared, and Cat Woman/Felicia’s robo-kitty sidekicks, Sharp and Flat (music pun, Sharp is the mean one and Flat is the lazy one) have appeared. Oh, and we met the creator of these ‘bots, the one and only Dr. Miranda Ladget! She’s super nice, energetic, is about 37 years old, and is very creative. And, two new stories are underway! First, there’s Warped. An upgraded Mettalix(OC, a latge robot used as a a weapon) Who is smarter than the rest named Mettallon has found a time crystal that allows him to Time travel and change the past. He is now pulling our heroes to the future on a wild trip through time. We also learned that due to his meddling, the past is been changed and Many characters are different. Then we got another sequel, s many characters are different. Then we got another sequel , called The Mystery of Project Legion, which I’ll explain later. « Trekkies have one… shouldn’t Mega Man? Ask Me 3: The Final Lesson! ?